30th Street Blog: Celebrate St. Patrick's Day with an Irish Angel! 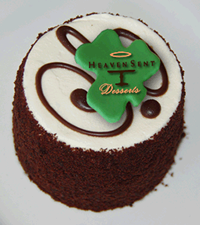 In your quest for the Irish , especially the Blarney ..., let the Irish Angel at Heaven Sent Desserts give you sustenance and comfort! Delicious, delectable and with the hint o' the Irish Cream o' Bailey's, irresistible.